The MGC-20 isochronous cyclotron is designed for acceleration of hydrogen and helium isotopes with capability of their energy variation. The cyclotron is capable to handle either internal or external ion beams. Being furnished with beryllium target the cyclotron becomes a source of fast neutron flow. 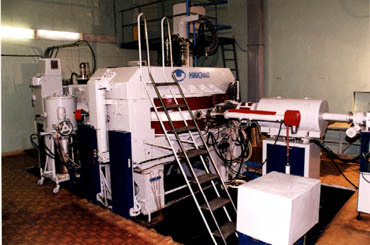 The MGC-20 can be used for production of radionuclides and for research in nuclear physics, activation analysis, neutron therapy, material structure analysis, etc. Ion source of arc type with "hot" cathode. Beam extraction system is a electrostatic deflector and magnetic channel. Automated control of the machine operation can be performed with information being read out on the PC display. The cyclotron may be provided with 115° energy analyzing magnet and the transport system delivering the beam to the distant targets.